The schoolmaster in 1803 Ohio can be quite strict. It’s 1803 at Parky’s Farm. 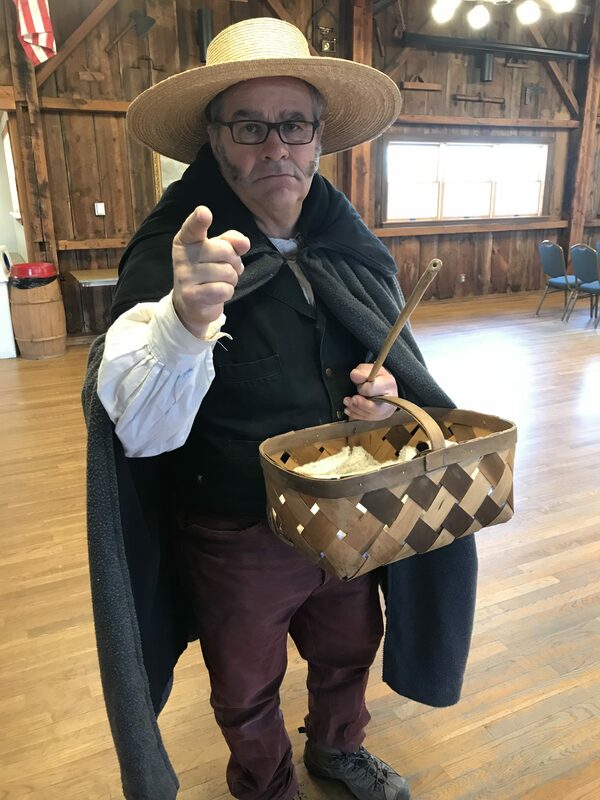 Winter is the time for this second grade program, as much of it is presented inside of the magnificent Hayloft Barn from January through mid-March. The field trip begins with the children going back in time by the use of a timeline. We start with today’s date and go backward, eliminating many of the things that make a second grader comfortable in 2019. There is no such thing as Fortnite, Fiona the hippopotamus doesn’t exist; there is no PlayStation, any cellphones or email. Their faces begin to turn. Martin Luther King Jr. never lived, McDonald’s hasn’t opened, women can’t vote and there are no cars. We walk most everywhere we go. Thomas Edison hasn’t invented the electric light bulb. (So we turn off the lights.) Abraham Lincoln hasn’t run for president. Ohio is not a state. The Ohio frontier is the Wild West. With a ringing bell, enter the schoolmaster or schoolmarm dressed in clothing of the era. The group is scolded for their lack of manners when they don’t stand for the elder adult after entering the room. The teacher of this one-room schoolhouse explains that he is taking over as their teacher, as their former teacher has married and cannot work outside the home. Their new instructor arranges the room to their liking. Girls must sit in the back of the room so the boys can be warm and have the best light up front. The children learn that school is not free; you must pay the teacher. Students must clean the school, take care of the horses and dig their own outhouse pit. They soon learn to curtsy and bow to elders. When a student misbehaves, the punishment is having to lean forward and place your nose in a circle on the blackboard with their backside facing their peers. The children really get into the play! They groom horses and learn to make their own clothes. There are no plastic toys or dolls in 1803. They make wooden toys, rag dolls and play games using their imaginations. They learn that you can have fun without batteries or electricity. It’s refreshing to see these second graders adapt to a simpler lifestyle, even if it is only for a four-hour field trip.